Just got back from a trip to Fairfax, Virginia to help DearMYRTLE with 4 presentations at the Fairfax Genealogical Society Spring Conference. On the way home, I had two stops to make. 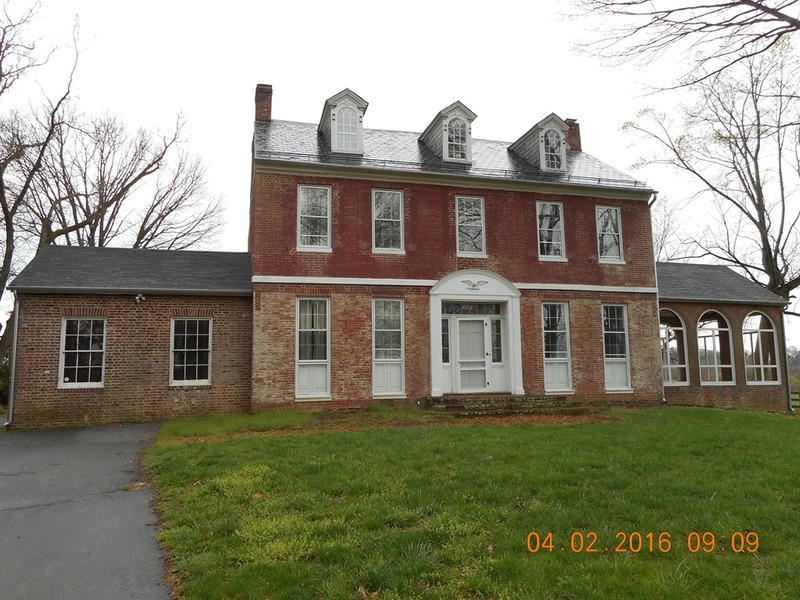 One was to drop off a book that I had created on the Worthington’s who lived in the Worthington House in the Monocacy Battlefield. 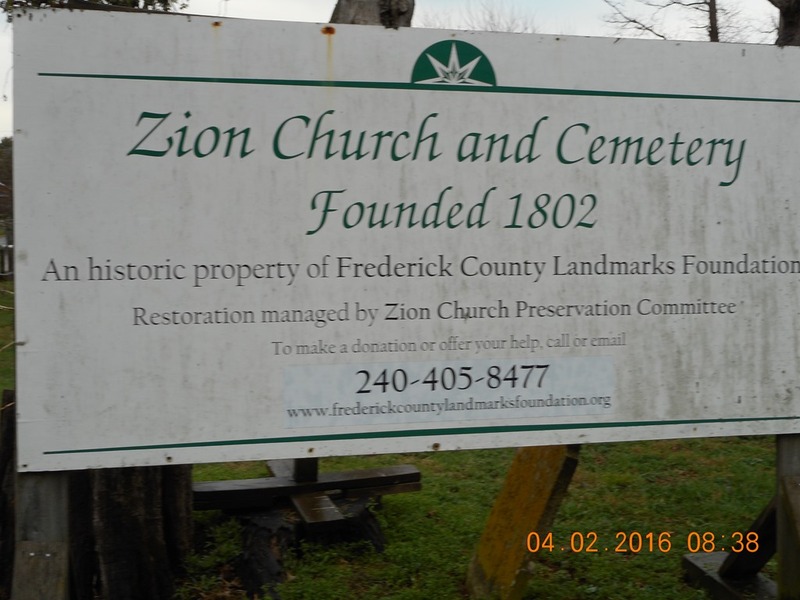 On the way there, I stopped by an old cemetery just south of the Battle field to see the renovations that had been done to the Zion Church and Cemetery, Founded in 1802. Here is a picture I took in 1999. Dropped of the book, as promised but stopped by the “Thomas Farm” house, the neighboring farm to the Worthington House. Have driven by it many times, but not close enough to take a photo. 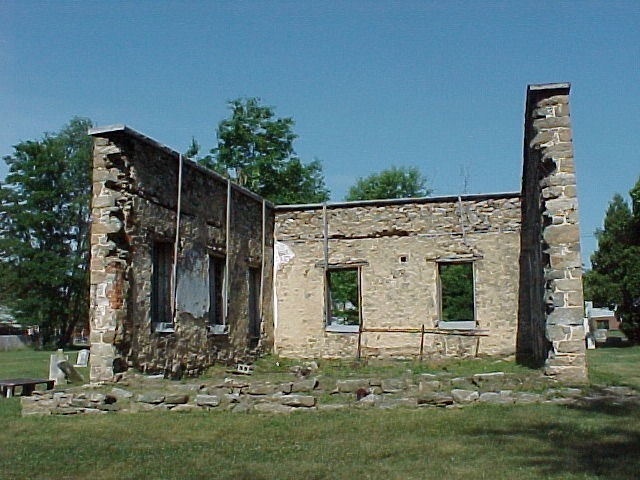 I have a 2nd cousin who lives just north of Gettysburg, but have never stopped by to visit. The “back story” is that I works for my 2nd cousin’s father one summer. 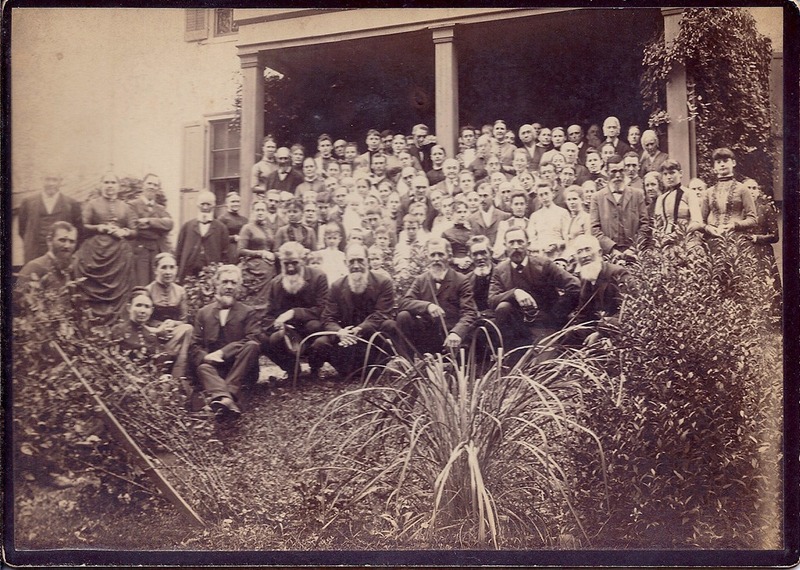 I knew about “the Gettysburg Farm” but didn’t know where it was. Today, I stopped, not out of the blue, but they were going to be home and it was OK to visit. The surprise was as soon as the door was open, I thought I had escaped by 60+ years, as the smell of Apple Sauce cooking just rolled out of the door. It was like walking into the kitchen of my grandmothers house, or even my mother as they cooks apple sauce. I had forgotten just how great freshly made, home made, apple sauce really was. Where was my camera when I needed it. On the stove was an apple sauce grinder just like my grandmother had and used on the stove, with it still dripping the sauce. In fact, the grinder was my grandmothers SISTERs apply sauce grinder doing all of the work, with a little help from my 2nd cousin. After catching up a little and talking about what I had been doing, and sharing my spare copy of the Monocacy book, we talked about my other cousin DearMYRTLE and how we were connected. Now, my 2nd cousin was from Chester County. I mentioned one of the names on a Power Point slide the Myrt showed in Fairfax the day before, and my cousin know immediately the surname. I didn’t have to say any more. 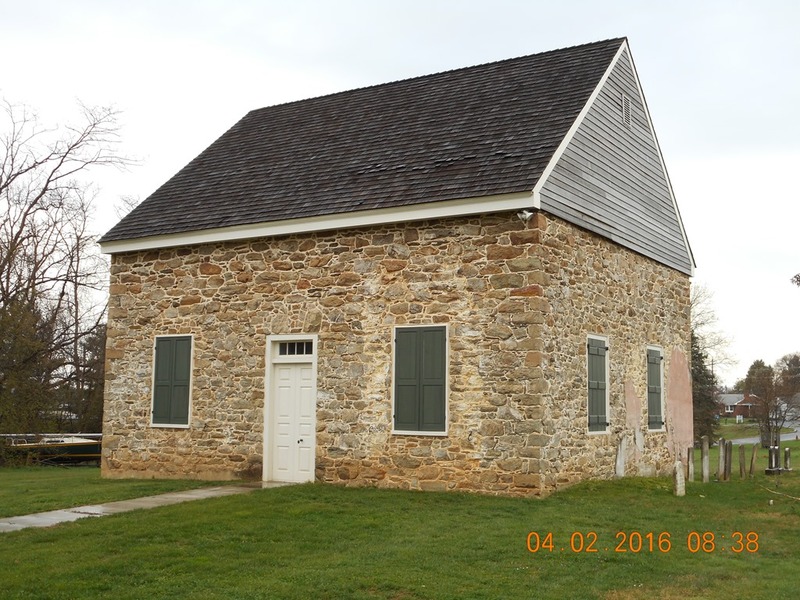 We talked a little more and mentioned Conrad Weiser, one my Myrt’s ancestors. 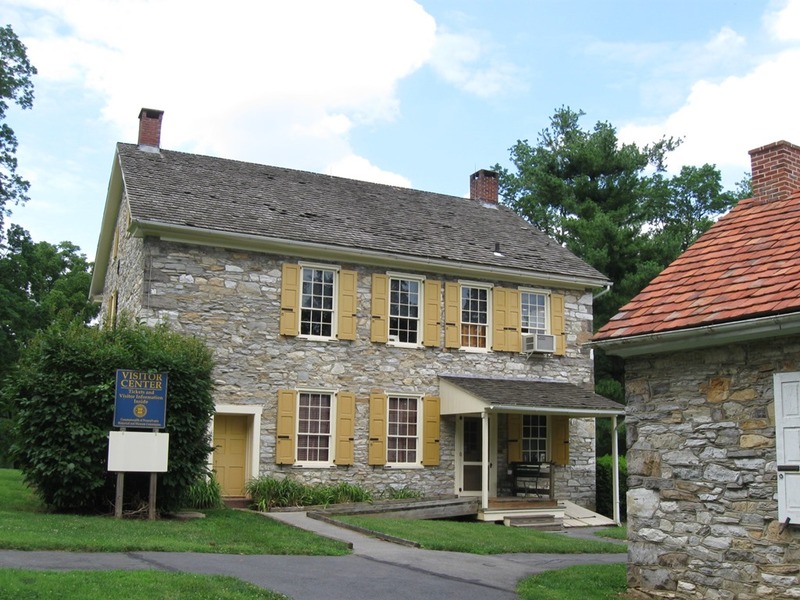 This is the Conrad Weiser Homestead in Womelsdorf, PA.
As soon as I mentioned “Weiser”, my cousin’s face lit up, her husband got up and went to a collection of CDs and brought back a Music CD by a Weiser. (sorry, forgot the artist name). But my cousin’s children KNOW the many Weiser family members living in the area. Now the homestead is probably 45 minutes away from where I was, but to make that connection, was NOT Expected. It’s been a Scanning Marathon these past couple of days. My recent blog posts have been about a project that I am working on, for a member of the generation before me. What that meant was a scanning project I have been waiting to really work on, was put on hold. Little did I know, that my 1st Cousin, one time removed was going to pass away. The photos were her daughters collection. Several hundred photos. I received a call earlier in the week that Marian Reynolds Bartram (1922 – 2012) had died. It wasn’t necessarily a surprise, but it was, and very sad for me. The Marathon started. Scanning both sides, as there won’t be time to scan and label correctly, but I need to get these photos back to my cousin. The nice thing is that they were not is shoe boxes for were grouped in large envelopes. The photos were in some sort of order, not sure what the order was, but I scanned by Envelope, in the order that the photos were in the envelope. Not taking a lot of time looking at the details, but wanted to make sure that any writing on the photo, front or back, was in the scan. Twice as much time to scan, but the labeling later will be a little easier. Still have about 300 to go, but I will be able to get them done for the weekend. The good news is that I will be able to have two Digital Picture Frames for the Celebration of Her Life on Saturday. One for her, and the second for their 5 daughters. The milk crate, with the photos will be returned along with a digital copy of the photographs. 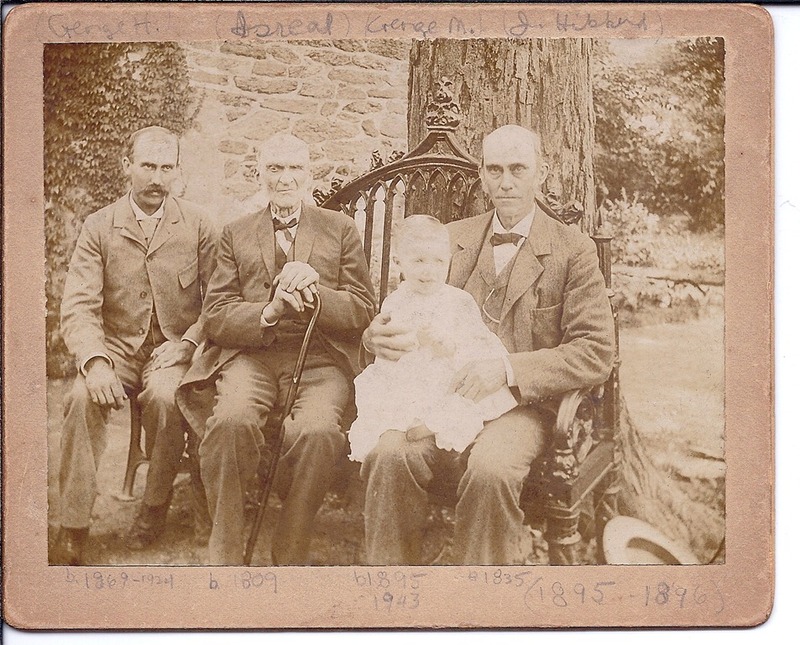 Since there were so many names on the Photos, and I had many of the names in my genealogy management software, I printed a Kinship Report for my 2nd cousin. So, she will know, if she doesn’t already know, what the relationship between her and the person in the photograph. There will also be a Genealogy Report from one of her ancestors. 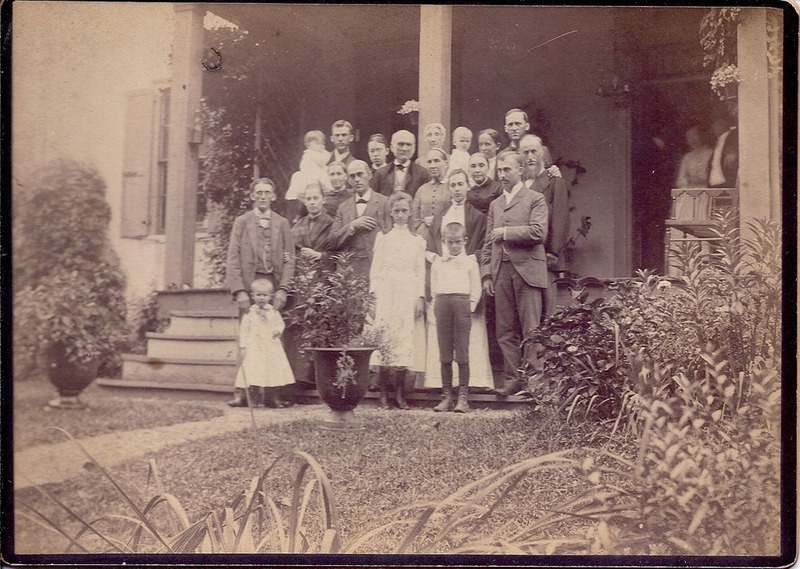 Family Reunion of Isreal L Bartram on his 80th birthday 1889. Look at all of the people in that photograph. In another envelope was another photograph. Same birthday party, much smaller group. Same place, same time, just not as many folk. Not knowing who the people are (yet), not sure what this smaller group is. But, Isreal L Bartram is there. 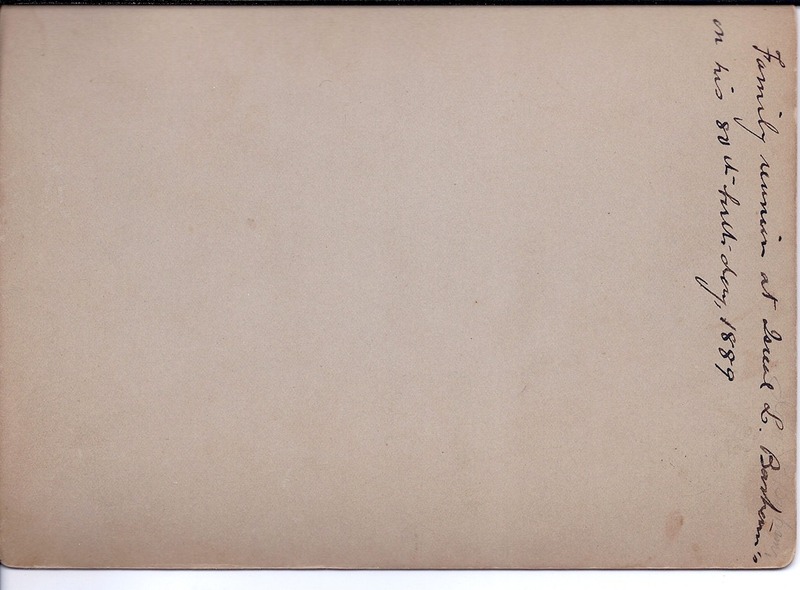 Yet, in another envelop is a 4 generation photograph. Names on the back are the fist line, the 2nd line is information that I have about that person. Side note: A son of G. Maurice Bartram was killed in an Automobile accident. There have been many pictures that I have been familiar with, some not so much, but many with names, dates, locations on the back. I am sure that by the time I finish, I will have a couple of other surprises, yet to be scanned.